Today is the First Sunday of Advent, the beginning of the time of preparation for Christmas; the coming of the Christ child. However, the makers of the scriptural lectionary, the collection of texts that we in the Reformed Tradition rely through the church year, did not want to make it too easy. They purposefully selected texts that look in two directions, speaking of both hope and fear. These texts not only look back to the birth of Jesus in Bethlehem, but also look forward to the culmination of all things. The Jeremiah passage speaks of a time, (“the days are surely coming”) when God will make things right, executing justice and righteousness in the land. We yearn for such a time. A word of hope. However, the Gospel passage speaks of fear, of coming calamities. Every First Advent Sunday includes a scripture reading about the second coming of Christ and ‘apocalypse’. And we’ve seen enough apocalyptic movies to know that is not good. This text from Luke epitomizes the “end-of-the-earth” images we often associate with that genre. Doesn’t it seem strange that we have to deal with such a gloomy subject as we prepare for the joyous event of Christmas? 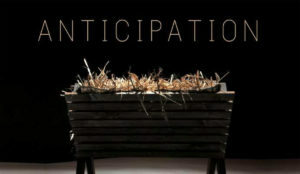 Yet, inherent in Advent is this great tension, Christ’s first coming and his second coming. It is concerned not only with the beginning of his time on earth but also the end of time, the end of the earth. In this sense, Advent is the anticipation of things to come. The song actually begins with these words: “We can never know about the days to come, but we think about them anyway.” Of course, the song is about her wondering if she’ll stay with the guy’s she with (Cat Stephens!) or should she be anticipating someone new. Whatever, the song does seem to convey the palpable feeling of anticipation. Just what is that palpable feeling of anticipation? Let’s break it down, a bit. First of all, anticipation is what happens in time – waiting, waiting for something to happen. And depending on what you are waiting for will determine the nature of the feeling. Sometimes the feeling is one of delight, because what you are waiting for is truly delightful. A party, a celebration, a rendezvous with one’s lover – the anticipation, the waiting, can be exhilaratingly delightful. Looking forward to a good thing. However, sometimes the pending event looms ominous and scary. Events we are afraid will go badly for us. In those situations, the resultant feeling is fear, downright fear. And in waiting for the hammer to fall the feeling of fear can overwhelm us. It might not even be certain doom that creates the fear. Not knowing the outcome, particularly if we are prone to worry, can make fear a most powerful feeling. But there is one other characteristic of anticipation I’d like to explore: The anticipation of resolution. Let’s look to music to help here. To state the obvious, music takes place in time. We experience music as it is happening, in time. But one of the things that makes music pleasurable is the anticipation of the future. We anticipate resolution. To illustrate, what do you feel when you hear this (cue Kelly)? The chord hangs in the air and even though you might enjoy the present-ness of that chord, your ears and your brains are anticipating this (cue Kelly). Ah, resolution. So, delight, fear, resolution – all combine to create the experience of anticipation. And in some, maybe, unexplained way all that greets us on this First Sunday of Advent. Luke’s Gospel gives us the last sermon of Jesus’ public ministry and he is clearly worried about the future. He paints a bleak picture of the end of the world. There is talk of nations in fear and of people dying in agony. Yet Jesus’ advice is “Stay awake, praying at all time for the strength to survive all that is going to happen.” In Jesus’ view there is something on the other side of disaster. The good news is that there, on the other side, final liberation and resurrection comes out of disaster. Like the prophets before him Jesus is painting a grim view of the future in order to influence the present. He does not want to paralyze them with fear but to energize them into action. The real purpose of speaking about the last days is to affect the present days. Be awake, look reality in the eye and then act. Or to put it another way, today’s gospel story calls us to do two things that can be very hard to hold together: To be realistic about how the world is going and at the same time not to lose hope in the future. And so we live on. We live in the tension of between times. We live celebrating his first coming, anticipating with delight all that Christmas means to us, our families, and our church community. At the same time, we live in anticipation of God’s work of justice and peace. In a world filled with fear, we might be prone to be fearful ourselves, letting it overwhelm us, freezing us, so we can’t move forward. We don’t know what the future holds. Maybe it’s all bad; maybe we are facing disaster. But Jesus urges us not to let fear do us in. Instead, he says, live in hope. Indeed, we are experiencing the dissonance of a chaotic, cacophonous world. We so desire resolution. We so want things to come to a harmonious resolution. But may I suggest that such a resolution does not just happen by itself. May I suggest that we are to be the resolution; or at least living our lives, working for that resolution. Indeed, may we be resolved. As we move into this time of Advent, may we live into the season with hope, even as we are realistic about what we face. May we be resolved, even if it is a shaky resolve. May we embrace this season of anticipation. Amen.